In a previous post I credited Thompson and Lizars with creating the first comparative, and theirs was the first to appear in an atlas. My research has since turned up another mountains chart, Die Höhen der alten und neuen Welt (translated as: The Heights of the Old and New World) c1810 by Bertuch, predating Thompson and Lizars by a handful of years. With one foot firmly in art, it’s whimsical in its depictions of climbers on Chimborazo and Mont Blanc, and a crocodile in the water at the bottom of the chart (making it suitable for children and indeed it appeared in a children’s book). Further, its old color, still vivid makes it all the more charming. Its other foot is firmly in the world of early comparatives; heights appear on the sides of the chart, towns appear amid the mountains, and faint horizontal lines show snow lines. Humboldt seeded the comparative genre by publishing Geography of Plants which illustrated a mountain in profile annotated with information describing points along the slope. The next step in the progression is a bit murky. There was a nexus between Humboldt (scientist and explorer), Goethe (scientist, among other things), and Bertuch (publisher) all working in early 19th century Germany. 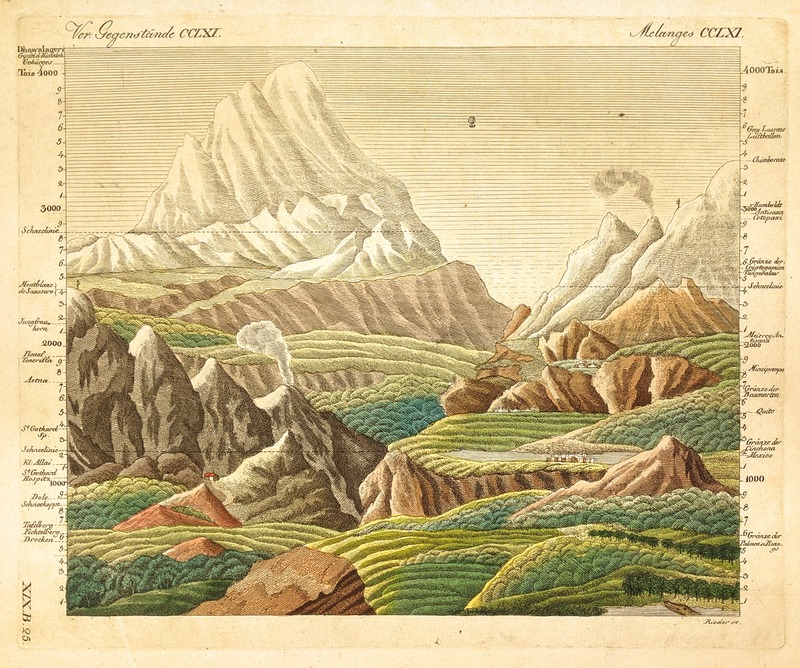 After reading Humboldt’s writings, Goethe prepared a manuscript with an exhibit inspired by Humboldt’s work comparing the vegetation at altitudes of the old and new world mountains. Goethe sent his manuscript to Humboldt, who apparently snubbing him, did not respond. Subsequently, whether Goethe sent his manuscript or Bertuch learned of it through other channels, Bertuch became aware of Goethe’s illustration and chose to include it in his Bilderbuch, a children’s book. Interestingly, for unknown reasons, Bertuch did not receive the illustration itself and was compelled to recreate it based on text descriptions. That this comparative appeared in a children’s book, but subsequent comparatives appeared in atlases is remarkable and hints at one of the exquisite qualities of these pieces. To be sure, this view is a simple, fictionalized landscape, making it suitable for a children’s book but, it is also packs a mighty data punch. While the elevation annotations on the sides of the view may have been of little interest to the children looking at the book, it was an excellent way to bring to life what could otherwise be dry statistics, and make them approachable to the emerging middle class atlas buyers (who may have been of lower reading levels). This powerful combination gave the atlas publishers cause to include them in their works.